La formazione di Beauty Medical a Milano, offerta formativa. Milena Lardì and her staff offer highly specilised Tricpigmentation, Micropigmentation and Permanent makeup courses, individual or collective, to train the professional to be able to work individually. Beauty Medical offers a personalised service of training for Micrpigmentation courses. Permanent makeup courses are addressed to those who wish to express the creativity through the basic corrective makeup. Our courses are opened to whoever wants to learn or to deepen his knowledgle in the field. 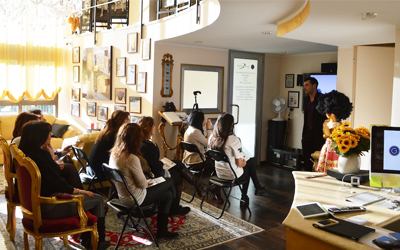 There are no minimum requisites required to sing up for the permanent makeup course. Our paramedic paramedic courses are addressed to all who already have a diploma for the basic techniques and want to specialise in a different field from the aesthetic one, alongside the medical world. The most frequent collaboration is between the micropigmentist and the dermetologist, the plastic surgeon and the oncologist. The paramedic micropigmentation can accopany a topic or systemic therapy, temporarily camouflaging ipo or iper coloured patches or can take action on a post surgery scar, such as breast augmentation, reduction, mastectomy or mastoplexy. These courses are only individual and last one day. . The training for Tricopigmentation is addressed to baldness surgeons, doctors, dermatologists or professionals of the field whose aim is to use our method as an alternative or an addition to a pharmacological therapy (whenever it was not sufficient or the patient did not respond to it properly) or to an hair transplant (whenever the density achieved was not sufficient or the patient could not undergo the surgery). All the baldness professionals can approach the world of Tricopigmentation thanks to the training experience developed by Milena Lardì and her staff. Click here to get more information about the tricopigmentation courses: Corsi di Tricopigmentazione. Micropigmentation is a term that become common around 10 years ago, when the permanent makeup was assuming its own identity, seperating itself from tattoos. At the early 1990s, to be detached from the idea that the tattooed makeup belonged to the previous years, idea that had left a bad mark in the common imagination, the newest techniques in the field started being distinguished with more scientific names, such as micropgimentation. There are many synonyms for micropigmentation: CPM, chromatic permanent makeup, aesthetic dermography and semi-permanent makeup. All these terms distinguish themselves from the permanent makeup, more easily traced back to tattoos. Actually, nowadays permanent makeup and semipermanent makeup mean the same. By now there is no operator that would take the risk to inject tattoos pigments in the face of a patient. The world micropigmentation includes all the techniques in which a specific pigment is injected in the dermis in order to embellish and camouflage some areas of the face. When we talk about micropigmentation we think about a professional and technically prepared figure who uses specific products, safe for whoever will undergo the treatment. Needles, pigments and all the materials are sterile and disposable. For that reason the companies equipped themselves in order to offer the best service possible and to respond the demands of the market. Beauty Medical leans on Mario Gisbert’s Goldeneye International, leader in the field of aesthetic/paramedic micropigmentation all around the world. Micropigmentation is an aesthetic technique that foresees the introduction of specific pigments into the skin in order to modify, to correct, to embellish and to balance some parts of the body and of the face. In order to achieve the perfect and precise deposit of the pigment in the superficial dermis, specific needles are used. Through the years, thanks to the research and the experience, it has been possible to identify different application fields for this technique, that in the beginning was linked to the permanent makeup. Nowadays, micropigmentation is divided in three categories: aesthetic, corrective, reconstructive. Specifically, aesthetic micropigmentation, until today known as permanent makeup, is used to modify and redefine the shape of eyebrows, lips and eyes; the corrective micropigmentation is used to take action against incorrect shapes or mistaken colours; the reconstructive micropigmentation, also know as paramedic, is applied to camouflage scars and vitiligo and to rebuild the mammary areola after a surgery, so can be considered the evolution of the camouflage. The camouflage is a particular kind of makeup that requires the use of special cosmetics and that can be performed also in the hospitals as a real cure. However, thanks to the the newest technologies and to the continuous researches, it has been possible to develop products, such as those used for micropigmentation, that, since they are completely safe, can be placed not only on the surface of the skin, but also inside the dermis, without changing for a long period. This way, the patient reaches the same goal of the classic camouflage, the total coverage of the dischromic area, but without the burden of applying something daily. The micropigmentation treatment is somehow similar to a tattoo, even if is different in the duration, in the pigment used, in the depth of the color deposit, in the machinery used and in the professional skills of the operator. The pigment used for micropigmetation, in fact, deposits in the superficial layer of the dermis and is eliminated naturally by the process of regeneration of the skin in around 24 months. However, the total and uniform disappearance of the pigment is not guaranteed. Moreover, the pigment used for micropigmentation differs from the one used for the tattoo in the chemical composition. The accessories used for micropigmentation, being sterile and disposable, do not have to be sterilised every time like those for the tattoos. The micropigmentist has the technical and professional skills required for the aesthetic world, such as the study of the morphology of the face, the knowledge about the structure of the skin, the traditional makeup bases, the hygienic notions… And he completes his knowledge with a specific training to learn the theoretical and pratical aspects of micropigmentation treatments. It is also very important that he has transversal characteristics, such as the ability to listen, empathy, sensibility, aesthetic sense, the ability to give advices and a lot of humility, which means to be aware that is always necessary to keep on learning.